We added Case to our family and our breeding program in 2014 and we couldn't have made a better choice! I LOVE THIS DOG!!! He is FULL of personality, loyalty, and beauty! He loves playing with the kids, swimming in the ponds or horse troughs, chasing the cats, and trying to herd the cows... But most of all he loves to be at my feet, or having the kids use him as a pillow. He is was what I had been waiting for and looking for in a sire! He has amber eyes with a partial blue left eye, correct stance, head and ears, correct scissor bite, thick full coat, and correct proportioned body. He has the look to go in the show ring, but still built to do what he is bred to do, HERD! We received Carley in 2014 when her owner decided she was too much dog for her. We were promised her registration paper, but her owners never replied to us again. Nevertheless, we decided this wonderful dog was too precious not to share! She has such a drive to HERD, such a sweet disposition, and is so conformationally sound for a working stock Aussie we decided to hardship register her. This girl is such a part of the family as are all of them, but she's my "special" girl! Jalee is SUCH a sweet heart! We are so blessed to have been able to add her to our family and our program! 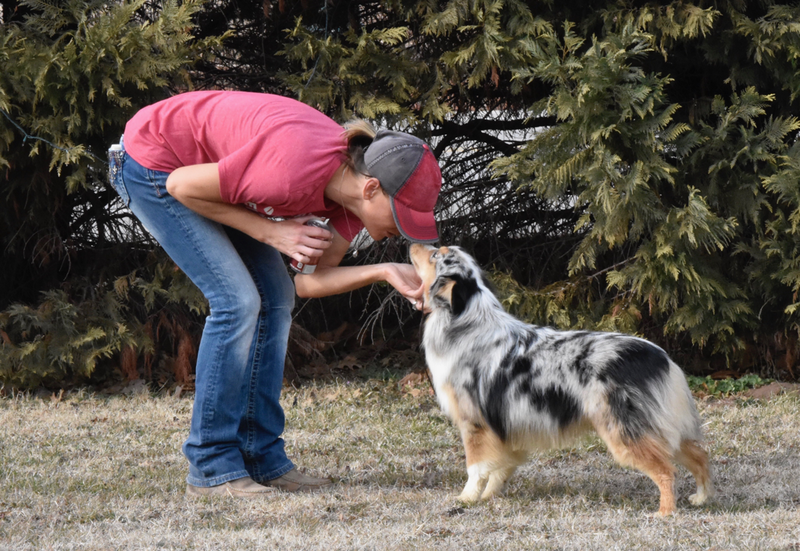 She has a good herding drive and a bubbly personality that makes anyone fall in love with her the first time they meet her. She has a beautiful confirmation that is near to the old working lines with a great stride and a clean and correct scissor bite. Jaycie is so sweet!!! Our nick name for her is our little "bug, bug". She's everything you should be looking for in an Aussie is found in our little Jaycie, but in a compact size. We can't wait to see this little sweetie start our mini program...stay tuned. She has a herding drive, even in all her littleness. Infinity's Michelangelo @Rustic Lace "Mikey"
No testing has been completed on his hips, elbows, knees, or eyes at this time. For more information on Mikey, please click his registered name above!